Connect with other K-12 teachers of mathematics in Riverside and San Bernardino counties to bring alive in classrooms the Eight Standards for Mathematical Practice. Register now for the Local Regional Network Meetings on January 16, 2018, from 4:00 p.m. to 6:30 p.m. RSBCMTA will conduct three concurrent meetings that will include a virtual component to link all the groups followed by local sharing, networking and dinner. The cost for current members of RSBCMTA is $10.00. The cost for non-members is $20.00 (one-year membership included for non-members)..
For more information and to download the application visit our Teacher Recognition webpage. This is the first step. You can leave your responses in the comments section that follows the blog post.. Chris will facilitate the sharing of ideas and how you plan on changing the world. You are invited to participate regardless of whether or not you attended the Fall For Math Conference. The date of the first virtual/physical meeting is January 16, 2018. This one-day conference continues to provide high-quality, low-cost professional learning opportunities for K-12 teachers of mathematics in Riverside and San Bernardino Counties. This event is sponsored by the California Mathematics Network Region 10 and supported by RSBCMTA.. Registration is now open and the conference flyer can be downloaded. Select this link. For more information about MaTHink 2018 or to submit a proposal to present at MaTHink 2018, select this link. Save the date for our 2nd Annual one-day conference. Network and learn with local educators. 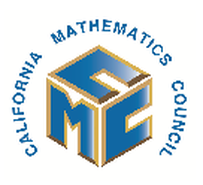 RSBCMTA is affiliated with the California Mathematics Council (CMC) and with the National Council of Teachers of Mathematics (NCTM).